Today is May 1st, which makes it time to link up with Farley for her Currently linky! Listening to Survivor. Yes, I am a reality show junky. Amazing Race, Top Chef, Project Runway, and Survivor are my crack. Plus a little trash - Real Housewives, Atlanta. They are so awful! Loving that the end of the year is near. 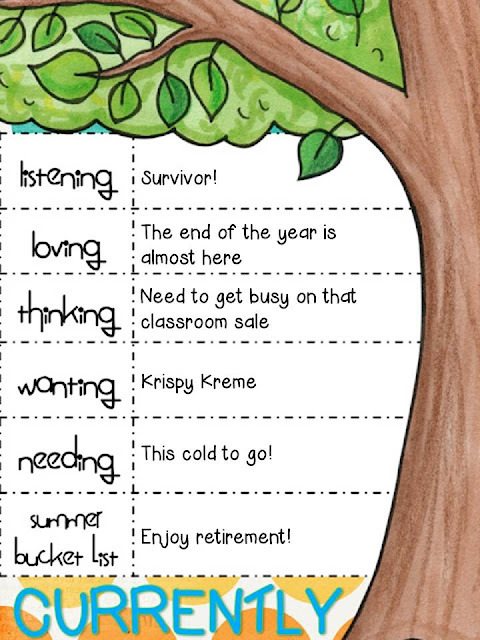 I am retiring this year, and I have so much to do before June 7th!! Thinking that I need to get on that teacher material sale and stop procrastinating. I already have 2 storerooms and a garage full of teaching materials. They need to go! Wanting that Krispy Kreme doughnut that is calling my name. My best bestie picked up a few yesterday and the raspberry filled one is singing a siren song! Needing to get rid of this darn cold! I was so sick during STAAR testing and the allergies around here don't help. I'm tired of sounding like I could sing bass in a barbershop quartet. And the coughing! Needs to go! Summer bucket list? Enjoy retirement! Now, go visit the party! Oh I LOVE Project Runway! Congratulations on retiring! You've got a good amount of teaching stuff to sell! 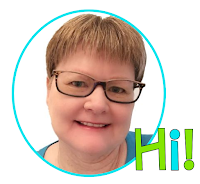 That money should go towards a nice little vacation, you deserve it ;o) I found you through Farley's linky and am happy to be your newest follower! Congratulations on your retirement! The allergies here in Austin are just killing me. I think between my team members and I we could stock a pharmacy! And Krispy Kreme donut- warm and yummy sounds so good. They're fat free on Fridays, right? KRISPY KREME???? not a Fiesta Cookie... what is wrong with you you must be REALLY sick!!! i am super sad... this is the year of THE GREAT TEACHER RETIREMENT!!! tho thad!! !